“ENGELS never flew on an aeroplane; Stalin never wore Dacron.” Thus China’s late leader, Deng Xiaoping, to a meeting 30 years ago that is now officially seen as the starting-point of his economic and political reforms. Deng’s words meant Maoist dogma was out and pragmatism was in. A dramatically transformed China is now commemorating the anniversary. But even as officials trot out a litany of achievements they attribute to the country’s “reform and opening” policy—200m fewer citizens living in poverty, a 6% share of global GDP compared with 1.8% in 1978, a nearly 70% increase in grain production—the world’s financial crisis weighs heavily on their minds, and their leaders are struggling with unfinished business. Vice-President Xi Jinping, heir-apparent to President Hu Jintao, is said to have been appointed chief organiser of the celebration programme. It includes concerts, exhibitions and endless speeches celebrating the “turning point” in China’s history when Deng gained the upper hand over the Maoists. His victory was evident at two meetings held in November and December 1978. The first was a month-long “work conference” of the Communist Party’s Central Committee, probably the liveliest gathering of its kind ever held (it was here, according to some Western scholars, that Deng mentioned Dacron). A more scripted and formal plenum followed it. Next year the country will mark its 60th birthday as a people’s republic (in Confucian tradition, 60th birthdays are particularly significant). 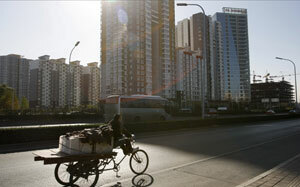 Reform and opening has thus taken up half of China’s communist life. But officials are being careful to manage expectations of further change. Deng once suggested that direct elections to national leadership posts could be held by 2050. No one mentions that now. On the economic side huge challenges loom, among them an ageing population and a blighted environment, both of which could drag down growth. Deng, who died in 1997, is often described as the chief architect of reform, as if the sweeping changes of the past 30 years were mapped out by him. He himself more accurately described his approach as “crossing a river by feeling the stones”. The ultimate objective has never been clear. Since 1992 it has been to set up a “socialist market economy”, but officials struggle to explain how this differs from a real one. Deng announced that year that the party’s “basic line” (party-speak for reform and opening under one-party rule) would not change for 100 years. This implies a lot more stone-groping. Party leaders revel in this obscurity. It gives them flexibility in policymaking and makes it easier for them to forge compromises between factions. One of the most important political changes in China over the past 30 years has been a move away from the vicious factional strife of the Maoist era, a tendency that persisted well into the 1980s and fuelled the pro-democracy upheaval of 1989. In 2002, for the first time in China’s communist history, power was smoothly transferred from one set of leaders to another without killings or purgings. The new leaders express the same commitment to reform, but have a more left-wing agenda. Papering over some of the party’s history has helped them too, damping public demands for political change. The history of the reform programme itself has been sanitised and simplified in order to minimise public questioning of leaders’ motives and actions. No mention is made, for example, of a vital part of the background to the party meetings, Democracy Wall—a 200-metre-long brick structure in front of a bus depot west of Tiananmen Square. For a remarkable four months in the winter of 1978-79, until Deng decided to shut it down and jail some of its activists, citizens plastered the wall with posters calling for freedom and democracy. The area is now a plaza flanked by shopping malls. Party officials, preferring their heroes to be larger than life, have massaged history to imply that the meetings 30 years ago were a clarion call for reform and opening. They were not. The dismantling of the Maoist edifice after the Chairman’s death in 1976 began more by stealth. A shift of emphasis towards rebuilding the economy was already under way long before the meetings began. Political rapprochement with the West—a key part of the “opening”—began several years before Mao’s death, driven by a shared dislike of the Soviet Union. The word “opening” did not even appear in the communiqué issued on December 22nd 1978, at the end of the two meetings. “Reform” was mentioned only once. A draft policy document on agriculture adopted by the leaders and promulgated the next year specifically rejected the idea, now considered a hallmark of China’s rural reforms, of contracting out rural land to peasants to farm by themselves. By contrast, Mao’s disastrous “people’s communes” were praised. Deng’s reformist victory was suffused with compromise, a pattern that persists to this day. Some in the Chinese media now talk of a “Beijing consensus” as an alternative philosophy to the “Washington consensus” of liberal economics that lately seems so discredited. China’s state-run news agency, Xinhua, recently said the Beijing consensus meant “prudence in market reforms”. Deng was certainly prudent. He knew the importance of giving the Maoists some face, even as he consolidated his grip on power and allowed experiments to be carried out with precisely the kinds of changes the Maoists disliked. Rural reforms began in late 1978 in the central province of Anhui even as the party was holding its meetings in Beijing. Peasants in one commune there secretly started parcelling out land, expecting death for it, but soon gained backing from a provincial leader and Deng ally, Wan Li. Others gradually followed suit. By the time communes were formally dismantled in 1984, most had long disappeared in all but name. For at least the first half of the reform period, few were so confident. Today’s soaring city skylines are mainly the product of rapid growth in the past 15 years. And much of that growth is a product of hard-nosed liberal economics rather than any magic Chinese touch. Two of the most far-reaching reforms of the past 30 years—the dismantling of tens of thousands of state-owned enterprises (SOEs) and the privatisation of urban housing—did not take off until the late 1990s. In the case of enterprise closures, massive suffering (and not a little protest) was involved as millions were left unemployed. Pro-democracy unrest in the late 1980s played a far bigger role in turning China capitalist than either officials, or admirers of China’s supposed gradualist approach, suggest. The protests in China were ruthlessly crushed, but they—and the collapse of communism elsewhere—triggered fierce debate among Chinese leaders about the direction of reform. Some argued that a planned economy and tight social control were essential to the regime’s survival. Others said the tumult had been fuelled by precisely these strategies. Deng, at long last, decided Maoism should be dealt a decisive blow. He emerged from retirement in 1992 to put a stop to the bickering and set China on a decisive path towards a market economy. The boom was instantaneous. In 1978 Deng showed no such clarity of thought. He astutely read the tea-leaves of public opinion but had no grand vision. The 1980s were consumed by leadership struggles. Bao Tong, a former member of the party’s Central Committee who was jailed for sympathising with the protesters in 1989, says Deng’s original plan for the meetings 30 years ago was no more than to produce a consensus on the need to focus on the economy, then in tatters after the ravages of the Great Leap Forward in the late 1950s and the Cultural Revolution from 1966 until Mao’s death. Reform and opening was not even on his agenda. But the meetings did not proceed as expected. Deng, who was away on a foreign tour for the first few days, came back to find that discussions had been taken over by festering political grievances aired by leaders who had suffered under Mao. Delegates demanded the rehabilitation of purged colleagues and a re-evaluation of protests in Tiananmen Square in 1976, a few months before Mao’s death, which had been declared “counter-revolutionary”. For ordinary Chinese, it was the Beijing party committee’s decision, while the work conference was under way, to declare the Tiananmen protests “entirely revolutionary” that signalled the biggest change that year—not anything Deng or his allies said about the economy. The party likes to gloss over this. June 4th next year will be the 20th anniversary of the crushing of Tiananmen’s more famous protests, in 1989, in which thousands may have died. As they celebrate reform’s 30th birthday, officials do not want to suggest that any re-evaluation of the 1989 unrest may one day be possible. Not that they are likely to face much pressure to do so. The bloodshed is a distant memory now. But public opinion continues to shape the progress of China’s reforms. Liberal Chinese economists complain that the country still falls well short of what they would call a market economy. The currency is not fully convertible, so capital flows in and out of the country are controlled. So too, still, are some prices, including those of electricity, fuel and water. In January the government imposed new controls on some food prices. It lifted them again this month. Non-state-owned enterprises are now producing two-thirds of China’s manufacturing output, but SOEs dominate key sectors such as banking, telecoms, energy and the media. Between 2001 and 2006 the number of SOEs fell from 370,000 to 120,000, but this still left assets worth $1.3 trillion in state control. There is much more work to do. But the present set of leaders headed by President Hu and the prime minister, Wen Jiabao, worry more than their predecessors did about public reaction to painful restructuring. They have reason to be cautious. In the late 1990s around 30m workers were laid off as a result of SOE reform. China Labour Bulletin, an NGO based in Hong Kong, said in a September report that millions of these workers were left barely able to support their families, thanks to widespread corruption and a lack of clear policy guidelines. Messrs Hu and Wen, with their signature slogans of building a “harmonious society” and “putting people first”, want to give the impression that theirs is a more caring kind of capitalism. A change of tack, they feel, is necessary to avert a public backlash. Brakes began to be applied in 2004 after Larry Lang, a Hong Kong-based scholar and popular TV commentator in China, drew attention to asset-stripping during management buy-outs of SOEs, then a common form of privatisation. This struck a chord with many Chinese, who felt that factory bosses (officials, in effect) were getting fabulously rich as a result of such buy-outs, while workers were getting next to nothing. Officials responded by suspending the practice. Two years later, to stop him riling the public even more, they cancelled Mr Lang’s TV show. Cao Siyuan, an economist who helped draft China’s first bankruptcy law in the 1980s and now runs a bankruptcy consultancy, says the privatisation of larger SOEs has now all but ceased. Talk in the 1980s of encouraging private involvement in all competitive industries, he says, has been abandoned in favour of giving SOEs privileged positions in sectors the government regards as strategic (a term liberally interpreted). Mr Cao expects about 3,000 firms, most of them SOEs, to go through formal bankruptcy proceedings this year compared with 3,200 last year. The numbers that qualify for bankruptcy are ten times higher and rising, he says, but local officials are blocking SOEs from applying in order to preserve government reputations. China was highly praised around the world for dismantling the communes and for the big increase in agricultural output that followed (although raising prices paid to peasants for their grain helped, too). But the rural power structure has changed little since commune days. Land remains collectively owned, even though it is leased out to individual households to farm. This system has shut farmers out from the boom that cities have enjoyed as a result of the rapid emergence in the past few years of a free market in property. In October President Hu chaired a Central Committee plenum that was clearly intended to echo the one held 30 years ago. But it proved an anticlimax. Mr Hu and his colleagues remain fearful that any big change in the land system will unleash an avalanche of peasants on cities already struggling with meagre social provision. Although turning peasants into city-dwellers is crucial to maintain the fast growth of the past 30 years (nearly 10% a year on average since 1978), the government wants to keep a firm grip on the process. Migrants are allowed into big cities on sufferance. During the outbreak of SARS in 2003 Beijing was all but emptied of them. Many left in August during the Olympic games, as officials put indirect pressure on them to stay away. Like Deng and like Jiang Zemin who succeeded him, Mr Hu has paid little more than lip service to the idea of political reform. He repeats Deng’s disingenuous line that without democracy there can be no socialism or socialist modernisation. But some Chinese scholars have pointed out that even communist Vietnam—whose leaders eye with envy the success of China’s economic reforms—has done better on the political side. In an article published in May by an official journal, Reform Internal Reference, Gao Shangquan, a prominent Chinese economist, said that Vietnam had “fewer ideological obstacles than we have”—fewer arguments, he said, over what constitutes socialism and capitalism. In another article in June he noted that only last year a petition signed by 170 people (many of them former senior officials) had accused the party of leading China towards a “capitalist restoration”. Mr Hu certainly has no plans to weaken the party’s influence, much less to allow opposition to organise. The authorities have detained or questioned several signatories to an unusually bold call for political liberalisation issued by around 300 intellectuals on December 10th to mark the 60th anniversary of the universal declaration of human rights. And Mr Hu has devoted considerable effort (and the party considerable funds) to rebuilding the party’s grassroots organisation, which was dealt a body-blow by the closure of state-owned enterprises and the rapid growth of the private sector. Party officials have sent thousands of teams to persuade private firms to allow the establishment of trade unions (which in China are controlled by the party) as well as party cells. Their efforts have met some resistance, not least from foreign-invested enterprises. Wal-Mart, an American retail chain with around 100 superstores in China, was especially stubborn. Repeated meetings were arranged by party officials with Wal-Mart representatives in the eastern city of Nanjing in 2006 after the firm’s (reluctant) decision to allow a union branch. The officials, on instructions from the trade-union chief, Wang Zhaoguo, demanded a party cell too. Only six party members could be found in a workforce of more than 400, and those six did not feel a cell within Wal-Mart was needed. But the company succumbed, and others have followed. By the end of 2006, party cells had been established in more than two-thirds of larger non-state enterprises. Early this year, some official newspapers published calls for a new round of “thought liberation”. Some Chinese scholars openly appealed for a new phase of reform focusing more on politics. But crises intervened—upheaval in Tibet in March, an earthquake in May that killed tens of thousands—and so, too, did the deadening impact of the Olympic games, during which the authorities tried to suppress any hint of dissent. Now Chinese officials fret about the possibility of growing unrest as the economy suffers the impact of the global crisis. Democrats must wait.